Katniss Everdeen's pearl - Above is a close-up of the pearl that played a key role in Lions Gate Entertainment's Hunger Games - Catching Fire & Mocking Jay. Katniss's Pearl | When the production company of Catching Fire, the second sequel in the Hunger Games trilogy, needed a pearl for a special scene in the exciting new movie, they approached The Ross Jewelry Company in Atlanta to help them find a very special pearl. Peeta's Pearl Gift for Katniss | In describing what they wanted, the production company asked Tom Ross of The Ross Jewelry Company if he could provide them with a selection of pearls from which they could chose something special. Because Ross's company deals with some of the largest suppliers of pearls into the United States, Tom said that gathering a selection of special and unique pearls would be a very easy task. The member of the production company's Props Department working with Tom explained that the director would like to see a variety of pearl colors, sizes, and shapes. She further explained that, because of the way the pearl would be used in the movie, it was necessary that the pearl be undrilled and exactly as it might be discovered in the oyster where it had grown. Katniss's Pearl in Catching Fire | As requested and as promised, Tom gathered a unique and beautiful selection of pearls from suppliers across the United States. The pearls ranged in color and shape from white perfectly round to shimmering dark silver baroque pieces that were just as they had been found. After considering all of the candidates, the director of Catching Fire selected the pearls from which he would ultimately chose the one Peeta would give to Katniss. This selection consisted of six beautiful silver black pearls. 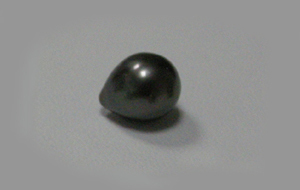 In the end, the pearl chosen from the selection appears above. If you haven't seen the movie, go see Catching Fire and watch how the pearl glistens as Peeta finds it, then presents it to Katniss. Then, you can come back and see it in detail. In the meantime, if you need pearls, you can find yours where they found the one Peeta gave Katiss . . . The Ross Jewelry Company in Atlanta. Our services are always warm and personal. To learn more about pearls, please click on any of the links below. Please don't hesitate to call or send us a note if you have any questions about pearls.